On October 7, 1988, a hunter reported three gray whales trapped in pack ice near Point Barrow, Alaska. The rescue effort that followed, nicknamed “Operation Breakthrough,” involved regional, national, and international cooperation. As part of Operation Breakthrough, holes were cut in the thick pack ice around Point Barrow, Alaska, to allow three stranded gray whales to breathe. Ultimately, Soviet icebreakers carved a path to the sea, although the success of the $1 million rescue effort has been questioned. On October 7, 1988, a hunter reported three gray whales trapped in pack ice near Point Barrow, Alaska. 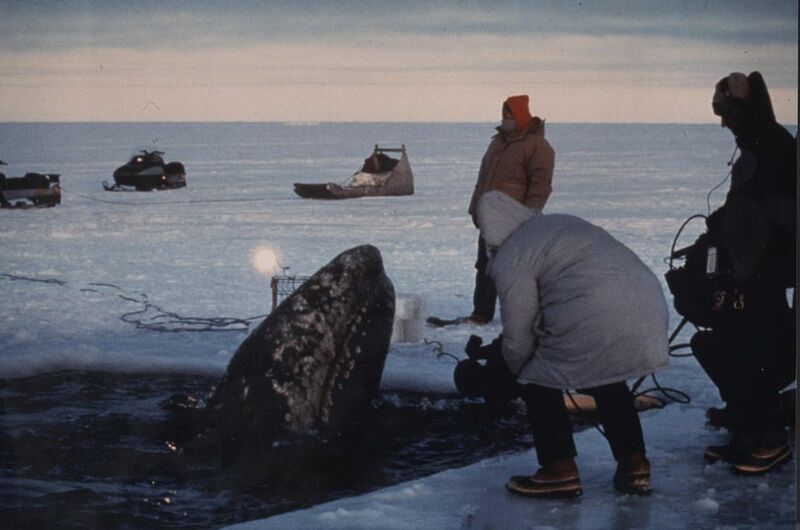 He immediately used a chainsaw to enlarge holes in the ice so the whales (all juveniles) could breathe more easily. The ice was too thick for him to cut a path to the open sea of the Arctic Ocean, however. The rescue operation to free the three whales—given the Inupiat names Putu, Siku, and Kanik—was called “Operation Breakthrough.” Operation Breakthrough was ultimately a million-dollar effort that involved cooperation between regional, national, and international organizations. Members of Operation Breakthrough included the indigenous Inupiat communities of northern Alaska, oil companies drilling in Alaska’s North Slope region, the Alaska National Guard, the National Oceanic and Atmospheric Administration (NOAA), Greenpeace, and even the Soviet Union. Operation Breakthrough may have worked, although the smallest, weakest whale (Kanik) died before the Soviet icebreakers cleared a path to the ocean. Radio tags were not attached to Putu and Siku, and they were not seen entering the ocean. Many observers assume the whales swam to freedom. the act of working together. to die or suffocate in a liquid. environmental organization whose mission is "to use peaceful protest and creative communication to expose global environmental problems and to promote solutions that are essential to a green and peaceful future." to pursue and kill an animal, usually for food. powerful ship made for creating paths through thick ice. unit made up of governments or groups in different countries, usually for a specific purpose. people and culture native to northern Alaska and northwestern Canada. animal that is no longer a baby but has not reached sexual maturity. scientist who studies ocean life. state or condition of death. having to do with the government or people of a country. military force controlled by a U.S. state but funded by the federal government and called up as part of the Army during national emergencies. U.S. Department of Commerce agency whose mission is to "understand and predict changes in climate, weather, oceans, and coasts; to share that knowledge and information with others, and; to conserve and manage coastal and marine ecosystems and resources." someone who watches, or observes. part of the ocean not belonging to any country or nation. Also called the high seas. large ice formation in seawater, pushed together by currents and winds. wireless transmission based on electromagnetic waves. any area on Earth with one or more common characteristics. Regions are the basic units of geography. planning and delivering aid to people in an emergency situation. person who studies a specific type of knowledge using the scientific method. to abandon or leave in a vulnerable position. always or almost always following limits, rules, or regulations.